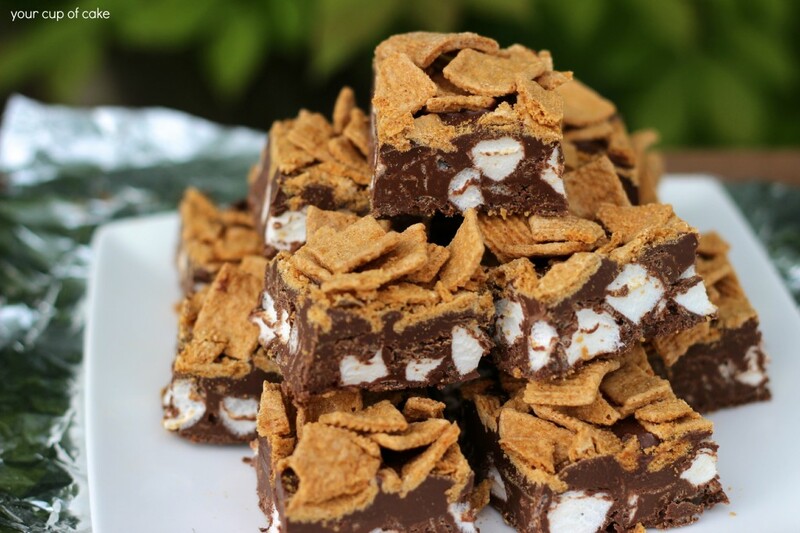 I’m calling this “fudge” though I’m sure there’s some definition for fudge that I didn’t quite fulfill but it’s great because my problem with s’mores is that there is too much marshmallow and not enough chocolate. This combo is perfect. 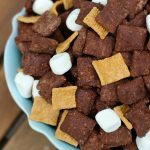 The chocolate is soft, the marshmallows aren’t sticking all over your face and the golden grahams are way better than graham crackers. 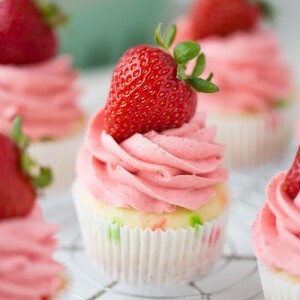 You can even cut this up in smaller pieces and serve them in mini cupcake liners! 1. 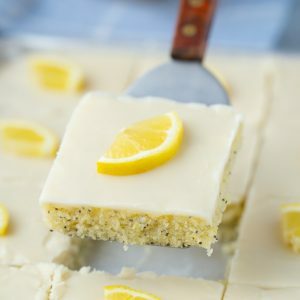 Line a 9X9 or an 8X8 inch pan with foil (let it hang over the sides so you can easily pull up on the flaps to bring out your finished treats) and butter the foil. 2. In a large bowl, melt chocolate, peanut butter and butter together in the microwave. Microwave for 45 seconds, then remove and stir. Continue to microwave in 10 second increments until smooth. 3. Take a 1/4 C. measuring cup and use it to remove that much meted chocolate. Set aside. 4. 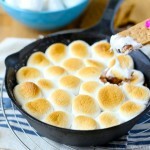 Add in cocoa rice krispies and marshmallows to your large bowl of melted chocolate and stir until combined. 5. Dump into prepared pan and spread out evenly. 6. The fudge will look lumpy, so help "smooth" it out and give it an even top, pour your extra 1/4 cup of melted chocolate over the layer. This will help to fill in around the marshmallows sticking up. 7. 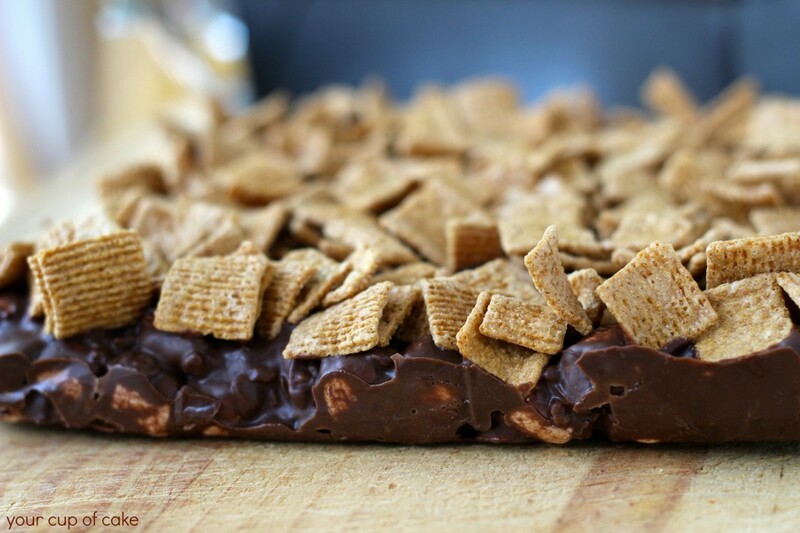 Sprinkle over enough Golden Grahams to cover the top and gently press them down so they get stuck in the chocolate. 8. Place in freezer for 1 few minutes to set. Cut with a warm knife and serve! These look really good Lizzy! 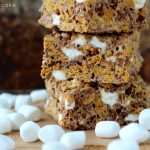 I agree with you wanting more chocolate than marshmallow. Your version looks just right. 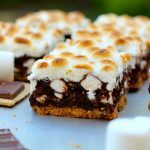 Sounds good to me- chocolate & marshmallow anything is good in my book. This looks SO good. I love smokes, but I think I would love this even more! 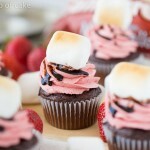 Hi Lizzy, do you have a seriously decadent chocolate cupcake receipe you would like to share? 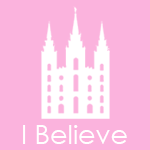 I have joined your site and just love it! My go-to chocolate cupcake is “My Favorite Chocolate Cupcake” recipe. 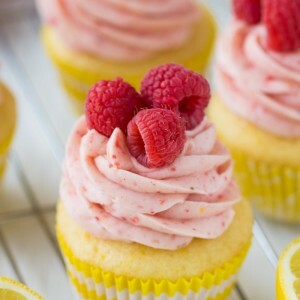 Just flip through the cupcake recipe pages to find it or search for it off on the right hand side in the search bar! 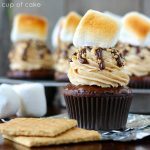 I made the “My Favorite Chocolate Cupcake” receipe for a backyard cookout and everyone loved it! 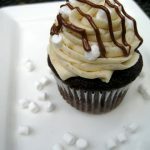 The hint of cinnamon, with the ganache and exceptionally decadent chocolate frosting was amazing!! My husband’s absolute favorite is dark chocolate. 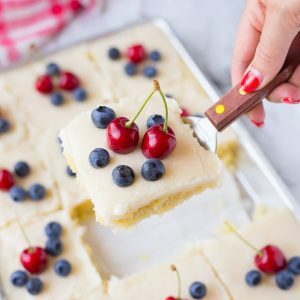 Is there anything I can add to the dough receipe to make the cake portion a deeper chocolate flavor? You can add a few ounces of melted baking chocolate! 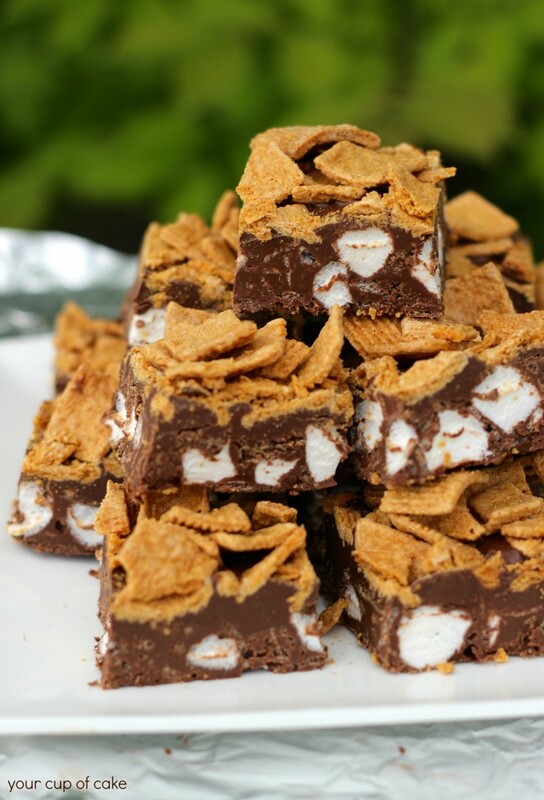 S’mores Fudge was fun to make & my hubby enjoyed them! Aw thanks so much! Glad you and your man enjoyed it! My question is do you have to use peanut butter? 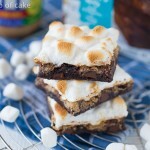 We are a house of nut allergies but also happen to be s’more lovers and would love to know if I could just remove the peanut butter if it would still turn out right? I know how the nut allergies can go, my brother is terribly allergic. The peanut butter is there to keep the chocolate from getting too hard. So add some butter instead! A few tablespoons should do the trick, not a full 3/4 cup but just under a half cup should be fine. I hope that helps!